From the company page, choose Manage on the Company Permissions card to view the Company Permissions Manager. Choose HR Administrators from the menu in the left-middle of the screen. Manage company settings – Access the company page and can manage basic company info (name, address, logo), Integrations, Document Templates, On-boarding Tasks, Locations & Departments. Note: only admins with access to All Team Members will be able to manage company settings. Manage benefits – Manage benefits for the company, including viewing benefit configuration, eligibility and enrollments, approving life events, and viewing reports related to open enrollment participation. Note: only admins with access to All Team Members will be able to manage benefits for the company. Note: Even if the View Compensation permission is disabled, an admin might be able to reverse-engineer the team's wages if there are compensation based benefits. 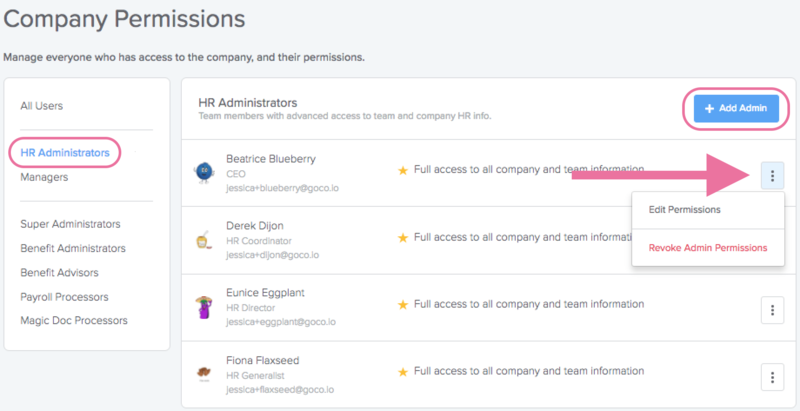 With team permissions you can scope what team members an admin has access to, ranging from specific departments to locations. For example, if you wanted to have an admin that oversees and manages all team members in the Sales department, you can do that by granting them access to just the Sales department. Hire, terminate, and edit team info – Hire team members, and edit their information. Note: compensation will always be visible during hiring. View sensitive info for team members – View compensation, SSNs, direct deposit bank info, tax withholdings, documents and time off liabilities. Complete Form I-9 – Complete the I-9 certification workflow. Manage Time Off – View, manage and approve time off requests and modify PTO balances. Manage Team Feedback – View team feedback ratings and comment on employee timelines. More Options Button (These are the three dots within each managers card): You can edit an individual admin's settings or Revoke Admin Permissions altogether. Note: only admins with “Full Access” will be able to manage permissions for the company. *Looking to give someone (e.g. your CPA) access to just the Payroll Dashboard that isn't an employee? Read the help guide here!